Google Plus earned an early reputation as being the social media platform to use if you are a geek or a blogger. In many ways, that was true because those are exactly the types of people who seek to know about a new way to connect with other people. However, there are many others that are opening Google Plus, staring at the screen and closing it off again because they have no idea what to do with it. Question: Why should you be using Google Plus? Answer: Any content you share on Google Plus gives weight to that webpage in terms of Google's Search Engine Results Pages (SERPs). Also, people who follow each other on Google+ will see each other's posts higher in their search results (when logged in to Google). Any content that is given a +1 recommendation makes that link more 'visible' and allows it to become more authoritative, therefore it will rank higher when a search is conducted. Part of Google's recent Search Engine Optimisation (SEO) update was to allow Google to process links from social media platforms. Of course they include their own platform but other social media platforms (e.g. Twitter, Facebook) are not as keen to share this information. This four-part series will help you get to grips with your Google Plus experience and teach you to love it. All Google Products are connected now with a "One Account For All" implimentation. You can read about how this improves your authority but it also means that if you have a GMail or YouTube account then you can use Google Plus without having to create another login. Make sure you get what you want from Google Plus. This includes honing who can send you notifications, who can comment on your public posts, settings for photos and videos and which of your own personal activity to show in the main timeline. You can reach the settings page by hovering over the word "Home" in the top left of your screen - "Settings" is the last option on the list. All adjustments are saved automatically. You need to ensure that your Google Plus profile is optimised as best as you can to enhance your visibility in Search Engine Results Pages (SERPs) but also so that you don't appear to be spamming with your own links. Where prompted upload a great cover photo (the large header image) and a nice personal photo (head and shoulders is best) and then check what your own profile looks like to others. The default setting is viewing the profile as yourself (i.e. so you can see everything you have posted) however only "Public" posts appear in the main timeline. You can view your own profile by hovering over the "Home" button in the top left of your screen - "Profile is the second option on the list. You can then use the drop-down menu at the top of the page to view your profile as yourself or as Public. If you need to change anything go back to your settings and adjust accordingly. You do not have to be friends with people on G+ to engage with them. If updates are 'Public' then anyone can interact with that post. When you engage with someone on G+ you can hover your cursor over their name and you are given the option to add them to a Circle. The Circle Concept is exactly the same as creating themed groups but it is worth noting that one person/connection can be in more than one circle. You can also add brand pages to Circles too. Circles give you the flexibility of checking updates from groups of people and targeting updates towards people who want to see them and who will engage with them. Find people from all walks of life and from every genre you want to connect with and group them into 'circles'. Public updates from people you have in circles will appear in your main timeline however if you search within G+ for a specific subject results will show all related public posts (more on this in Part 4). 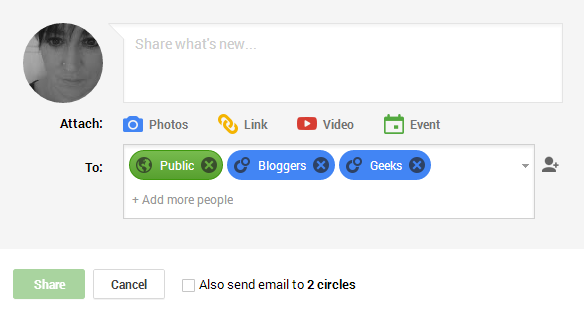 To help get you started on Google Plus I have shared some of my favourite circles below. Click on each circle to see the options available. Go and set up your Google Plus profile and please ask any questions in the comments or have a practice and tag me in an update or send me a message on G+ - I'm +Nickie O'Hara.